Maxwell D. Taylor was born in Keytesville, Missouri, on 26 August 1901. He graduated from the United States Military Academy in 1922 and was commissioned a second lieutenant. From 1923 to 1926, he served in Hawaii with the 3d Engineers. In 1925, he married Lydia Gardner Hopper. He was assigned to the 10th Field Artillery from 1926 to 1927. Promoted to first lieutenant in 1927, he studied French in Paris, and then taught French and Spanish at West Point until 1932. Taylor graduated from Field Artillery School and Command and General Staff School, in 1933 and 1935, respectively. In 1935, he was promoted to captain and studied Japanese at the American embassy in Tokyo from 1935 to 1939. Taylor graduated from the Army War College in 1940 and received a promotion to major. He served on a Hemispheric defense mission to Latin America in 1940. Taylor then served as the commander of the 12th Field Artillery Battalion, and in the Office of the Secretary of the General Staff. In 1941, he was made a temporary lieutenant colonel, and in 1942, received temporary promotions to colonel and brigadier general. Taylor served as the chief of staff and artillery commander of the 82d Airborne Division from 1942 to 1944. In 1944, Taylor was promoted to temporary major general. Then he led the 101st Airborne Division at Normandy and across Western Europe to the defeat of Germany. He was promoted to permanent lieutenant colonel in 1945, and permanent brigadier general in 1948. After World War II, Taylor was chief of staff of the European Command and then served as commander of U.S. Forces, Berlin, from 1949 to 1951. In 1951, Taylor became a temporary lieutenant general and permanent major general. In 1953, he was promoted to temporary general and commanded Eighth Army in the final operations of the Korean War. Taylor then commanded the United States Forces, Far East, and the Eighth Army from 1953 to 1954. In 1955, he led the United Nations Command. 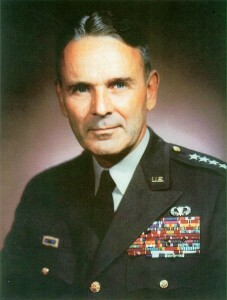 General Taylor served as Chief of Staff of the Army from 30 June 1955 to 30 June 1959. He opposed U.S. dependence upon the doctrine of massive retaliation against the Soviet Bloc, urged increases in conventional forces and flexible response, and guided Army operations in Little Rock, Arkansas, Lebanon, Berlin, and Taiwan. He retired from active duty in 1959. From 1962 to 1964, he returned to active duty to serve as Chairman of the Joint Chiefs of Staff. Upon retiring again, he served as ambassador to South Vietnam until 1965. Later, he was the chairman of the Foreign Intelligence Advisory Board from 1965 to 1969. Taylor died in Washington, D.C., on 19 April 1987.